Two new studies suggest that the black holes grow more rapidly than the galaxies they inhabit. This challenges the long-held idea that supermassive black holes grow in lockstep with their galaxies. 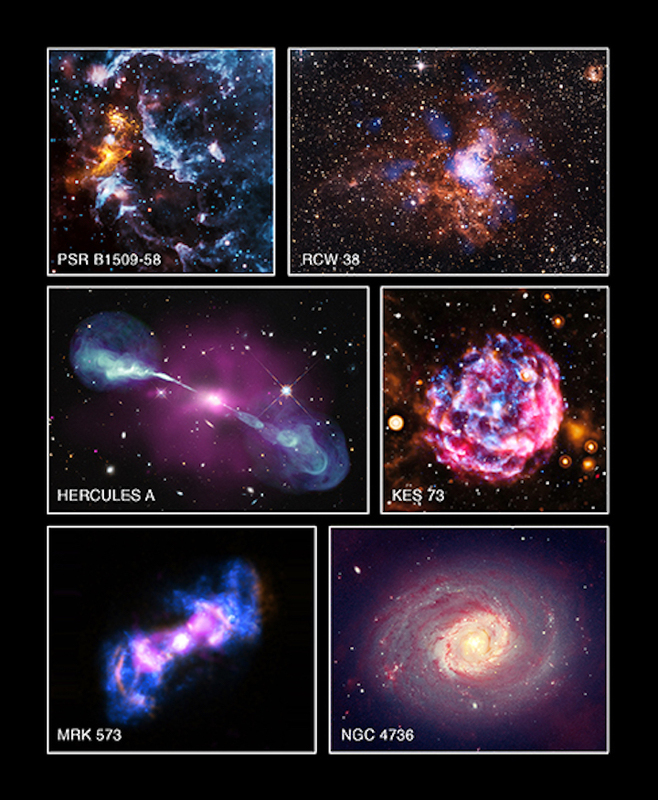 Researchers used deep datasets from Chandra and other telescopes, including Hubble, to make these new discoveries. It is still unknown exactly why the most massive black holes would grow more quickly and this will continue to be an active area of research. The growth of the biggest black holes in the Universe is outrunning the rate of formation of stars in the galaxies they inhabit, according to two new studies using data from NASA's Chandra X-ray Observatory and other telescopes and described in our latest press release. In this graphic an image from the Chandra Deep Field-South is shown. 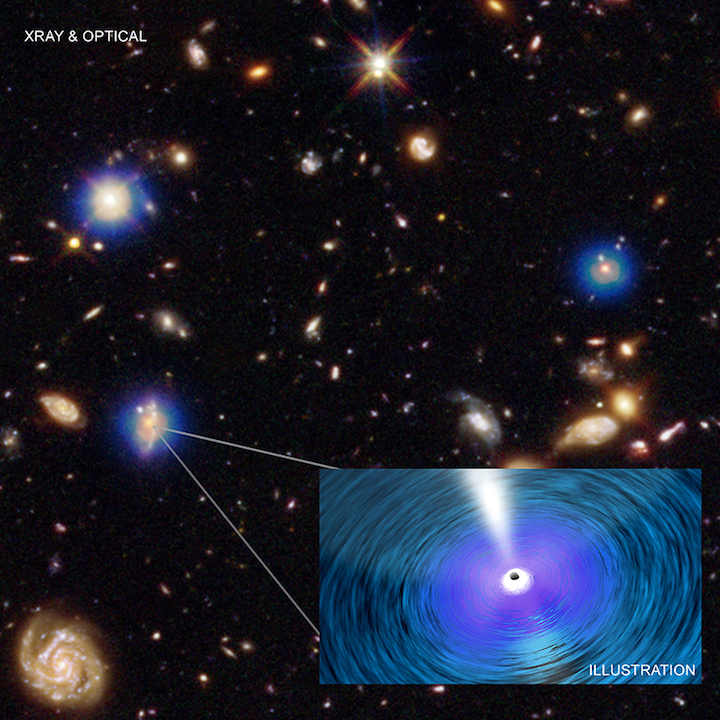 The Chandra image (blue) is the deepest ever obtained in X-rays. It has been combined with an optical and infrared image from the Hubble Space Telescope (HST), colored red, green, and blue. Each Chandra source is produced by hot gas falling towards a supermassive black hole in the center of the host galaxy, as depicted in the artist's illustration. One team of researchers, led by Guang Yang at Penn State, calculated the ratio between a supermassive black hole's growth rate and the growth rate of stars in its host galaxy and found it is much higher for more massive galaxies. For galaxies containing about 100 billion solar masses worth of stars, the ratio is about ten times higher than it is for galaxies containing about 10 billion solar masses worth of stars. The Mezcua study used X-ray data from Chandra and radio data from the Australia Telescope Compact Array, the Karl G. Jansky Very Large Array (VLA) and Very Long Baseline Array. One object in their sample is the large galaxy in the center of the Hercules galaxy cluster. 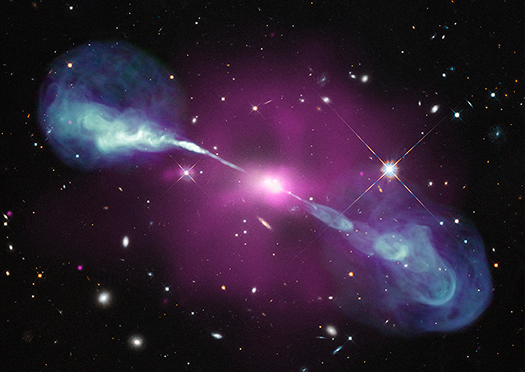 The image shown above includes Chandra data (purple), VLA data (blue) and HST optical data (appearing white). Two papers describing these results have been accepted in the Monthly Notices of the Royal Astronomical Society (MNRAS). The work by Mezcua et al. was published in the February 2018 issue MNRAS (available online: https://arxiv.org/abs/1710.10268). The paper by Yang et al. will appear in its April 2018 issue (available online: https://arxiv.org/abs/1710.09399).